This software Maintenance agreement is entered into as of [Agreement.CreatedDate] between [Sender.FirstName] [Sender.LastName] (Software Owner) and [Provider.FirstName] [Provider.LastName] (Service Provider) furthermore known as “The Parties”. PandaTip: This template outlines the scope of the software maintenance services being offered, the terms related to those services, and any additional conditions related to your agreement with the client. Beginning on the agreement date above the Service Provider will begin providing maintenance for the Software Owner for a period of 12 months unless termination by either party is requested. PandaTip: The granted access section of this template outlines any physical or digital locations that you’ll need access to in order to perform software maintenance. The Service Provider shall be granted access to any and all necessary printouts as well as documentation of any software that may have errors upon entering into this agreement. Furthermore, the Software Owner shall provide the Service Provider with access to the necessary computers as well as a reasonable amount of time to correct such software errors. In the event that new software errors are discovered, the same consideration will be taken and the Service Provider will be granted the access needed to comply with this agreement. Additionally, the Service Provider shall have access to facilities, computers, and software as necessary in order to perform period software maintenance and backups. PandaTip: The proprietary rights section of this template serves to protect your client’s intellectual property from harm or misuse. The Service Provider acknowledges that the Software Owner may have sensitive or proprietary information served on the computers or in the software being maintained. Therefore, the Service Provider agrees to treat any information served in such systems as confidential, and shall take every possible measure to ensure that such information is not deleted, modified, or distributed without the Software Owner’s consent. The Software Provider may, with the Software Owner’s consent, perform periodic updates or additional needed modifications to the software being maintained. Any modifications or costs incurred from corrections or replacements of an error to the software shall remain the responsibility of the Software Owner during the entirety of this agreement. In consideration of the tasks being performed during the term of this software maintenance agreement, the Software Owner has agreed to pay the Service Provider all sums listed in the table below. Any additional costs should be submitted in writing to the Software owner prior to agreeing to said costs. The Software Owner may, at their discretion ask for a report of costs as well as price matching for any materials needed for this software maintenance agreement. Any travel expenses should be submitted in writing to the Software Owner and are subject to their approval. If at any time payment is not received for any terms not agreed on between the parties it shall constitute a breach of contract and will be grounds for termination of this software maintenance agreement. PandaTip: The pricing table in the template above should be filled in to reflect any expected retainers, fees, or other costs related to this software maintenance agreement. The Software Owner shall be responsible for any and all taxes, titles, and fees due by the local government, federal government or any other governmental entity pertaining to this software maintenance agreement for the term of this agreement. The Service Provider along with any associates or employees under the Service Providers name shall under no circumstances divulge or communicate any personal materials relevant to the Software Owner or any employees or affiliates related to the Software Owner for personal benefit or gain. Any and all information deemed confidential during this agreement shall remain so during the term of this agreement and for a period of 12 months from this agreement’s termination. PandaTip: The software license warranty in this template will specify any warranties included with this software maintenance agreement and documents any terms and conditions within those warranties. Any and all software replaced during the term of this agreement shall be inclusive of all warranties and agreements inclusive to the purchase of said software. All warranties included in the purchases made during the term of this agreement pertaining to the software shall be included in this software maintenance agreement and fall under the same terms and conditions as so. The Service Provider agrees to complete all projects and maintenance assigned in a professional manner. All work conducted will fall under standards set by the region in which the work is being performed. The Service Provider will not be held responsible for any acts occurring from the Software Owner or any affiliates in relation to the Software Owner. PandaTip: The termination clause in this software maintenance agreement template will document any grounds for termination as well as any notification in regards to termination that is required by either participating party in this software maintenance agreement. The following occurrences will be grounds for termination of this agreement in its entirety. In the instance either party in this software maintenance agreement defaults on any terms or conditions set forth, the finding party shall notify the defaulting party in writing of the default occurring. Upon notification of said default the defaulting party will have 10 days to cure the default before termination will be required. In the instance either party of this agreement forms a breach during the term of this agreement due to uncontrollable circumstances including but not limited to, flood, hurricane, theft, terrorism, earthquake, or any other acts of god the party shall notify the remaining party of such breach and will be allowed up to 30 days to cure such breach before further action may take place. In the event any disagreements or controversies occur during the term of this software maintenance agreement both parties agree to seek arbitration to solve such manners. In the event the parties cannot come to an agreement on an arbitrator they shall both choose individually and the chosen arbitrators shall come to an agreement on a third joint arbitrator to hear this case. All arbitration shall be conducted in a central location easily accessible by both parties involved. The arbitrator shall be granted no access to modify or change this agreement in any way. Furthermore, the arbitrator will not award any punitive damages that may occur to either party. The arbitrator shall have the final say on any agreements involved and will subject such agreements to the court of [Company.State]. During the time of such arbitration taking place both parties will continue to uphold all agreements within this software maintenance agreements and complete all tasks assigned. This software maintenance agreement constitutes the entire agreement for the services listed herein, and shall supersede any and all previous agreements put in place either by written form or orally. PandaTip: Be sure that the Notice section of this template accurately reflects the contact information for both the Software Owner and Software Maintenance Provider. Any and all notifications with regard to this software maintenance agreement shall be made in written form and delivered to the responding party either by person or by email or certified mail to the following addresses. 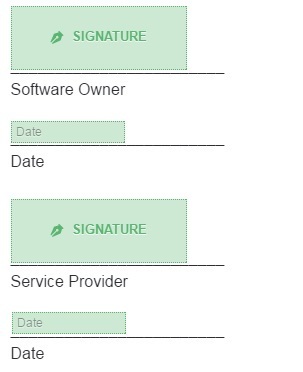 PandaTip: The signature sections in this software maintenance agreement template allow you and the Software Owner to e-sign this agreement from your computer, smartphone, or tablet..
By signing below, both parties acknowledge they have read and understand all terms and conditions found within this software maintenance agreement.